This was my first encounter with the songs of Austrian composer Siegmund von Hausegger, whose work is largely neglected today. Those here were written in mostly response to the poetry of Meyer and Birbaum, in the early part of his life between 1896 and 1902, and are predominately lyrical in character, with excursions in a humorous vein, such as the two songs using German translations of texts by Robert Burns. He composed comparatively little after the unexpected death of his father, mentor and teacher in 1899, gradually falling silent and concentrating on his conducting career. It was not just that loss which inhibited his creativity, but also the fact that his idiom, heavily influenced by a devotion to Wagner inherited from his father, increasingly fell out of fashion with the ascendant new Viennese School. 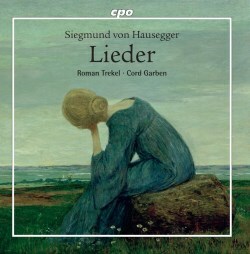 Roman Trekel has a smooth, pleasant baritone and his singing betrays no interpretative idiosyncrasies or technical weaknesses; he has made a number of recordings of slightly fringe repertoire in Germanic opera and Lieder and this latest one is very much in that mode. His easy top notes, dreamy half-voice and resonant low notes give his voice an expressive range and edge. His diction is excellent, without exaggeration. You could not ask for a more experienced, accomplished or sensitive accompanist than Cord Garben. The songs themselves are brief, moody and soulful and although they are neatly crafted, they sometimes seem to draw to a close before they have got going and I find their chromatic, sub-Wagnerian meanderings oddly unmemorable. I have to say that after several attempts I hear nothing striking or remarkable in them, for all the fervent advocacy of the performers and the author of the full, learned and informative notes, especially in comparison with the songs of contemporaries such as Richard Strauss. The sound is exemplary in terms of balance, warmth and clarity and the production values of the presentation are very high. I just wish I were more engaged by the songs themselves; others may feel more positively about them.